Etienne Provost (Provot, Proveau) was born in 1785 in Chambly, Quebec. Chambly was small farming community twenty miles south of Montreal. Little is known of Provost before he became involved in the St. Louis fur trade. There are indications Provost and Joseph Philibert were in the Arkansas River country by 1814. In 1815, Provost joined the August Chouteau and Jules deMun trade brigade bound for the upper Arkansas and Platte river country. Spanish authorities in Santa Fe arrested the Americans and confiscated their equipment and supplies. The Chouteau-deMun men were held in the Santa Fe jail for forty-eight days before being allowed to return to St. Louis. 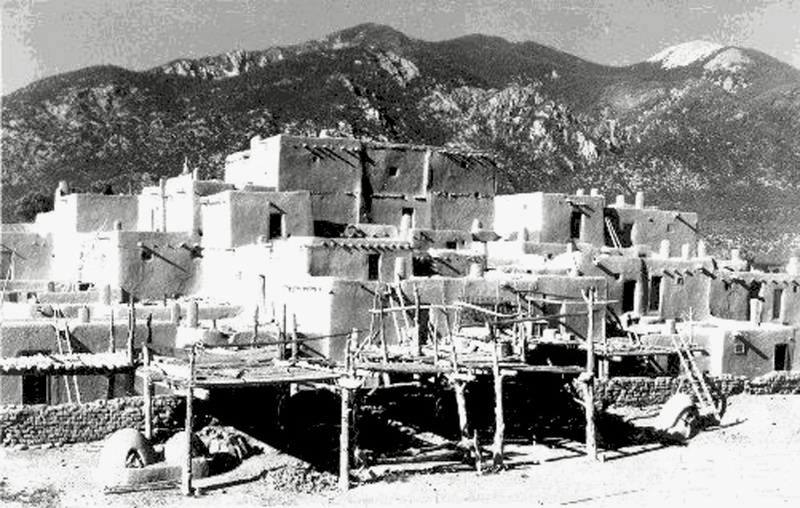 A year after Mexico’s Independence in 1821, Provost was in Taos, Mexico (New Mexico). Taos trappers trapped the bayous of the Colorado Front Range, the San Juan area of southwestern Colorado, the Salt and Gila rivers of Arizona, the Green and Duchesne rivers and Wasatch Mountains of Utah. There is one evil genius among them, called Bad Gotcha who fell in with a party of trappers led by a well known mountaineer, E. Proveau on a stream flowing into Big Lake that now bears his name, several years since. He invited the whites to smoke the calumet of peace with him, but insisted that it was contrary to his medicine to have an metallic near while smoking. Proveau, knowing the superstitious whims of the Indians, did not hesitate to set aside this arms and allow his men to follow his example; they then formed a circle by sitting indiscriminately in a ring and commenced the ceremony; during which at a preconcerted signal, the Indians fell upon them, and commenced the work of slaughter with their knives, which they had concealed under their robes an blankets…. 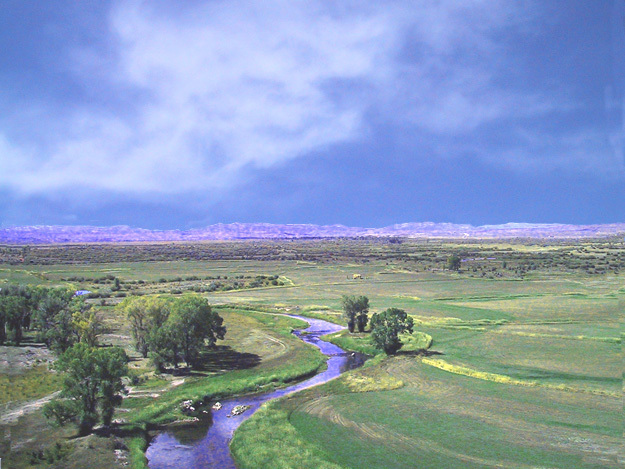 Following the loss of eight men, Provost and the other survivors made their way to the Green River in eastern Utah; they spent the winter at the mouth of the White River. Many historians give Jim Bridger credit for discovering Great Salt Lake in 1825, but it is difficult to believe Provost was in this location a year earlier and not know about Great Salt Lake. In May 1825, Etienne Provost with fifteen trappers encountered the Hudson’s Bay Company brigade under Peter Skene Ogden in Weber Canyon. Nearby was a camp of American trappers under Johnson Gardner. These brigade leaders represented Mexico, United States, and Canada: Etienne Provost and fifteen trappers from Taos, Mexico; Johnson Gardner and twenty-five Ashley-Henry trappers from St. Louis; Peter Skeen Ogden and fifty-eight trappers from Hudson’s Bay’s Flathead Post (Saleesh House) in Montana. While Provost was with the Hudson’s Bay trappers an argument broke out between Peter Skene Ogden and Johnson Gardner. The argument was over whether the trappers were on American or British soil. 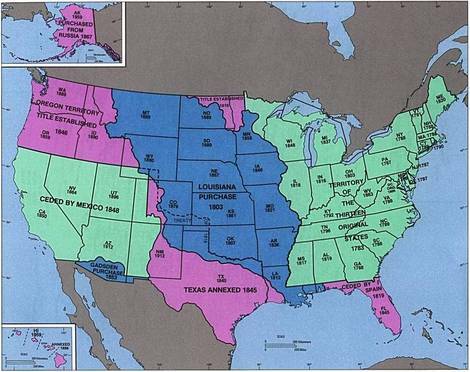 Gardner claimed they were on American soil and for the British to get out…they were actually on Mexican soil. Jack B. Tykal, Etienne Provost Man of the Mountains notes the only party with a legal right to trap in Mexican territory was the Etienne Provost party…provided Provost had obtained a Mexican trapping license. Camped near the Hudson’s Bay trappers, Johnson Gardner learned Ogden’s trappers were dissatisfied with the low prices paid for beaver and the high prices charged for supplies by the Hudson’s Bay Company. Gardner offered the trappers a higher price for beaver pelts and lower priced supplies. John Grey (Ignace Hatchiorauquasha) and twenty-two of Ogden’s trappers joined Gardner’s trapping brigade; the Hudson’s Bay trappers brought 700 beaver pelts with them. 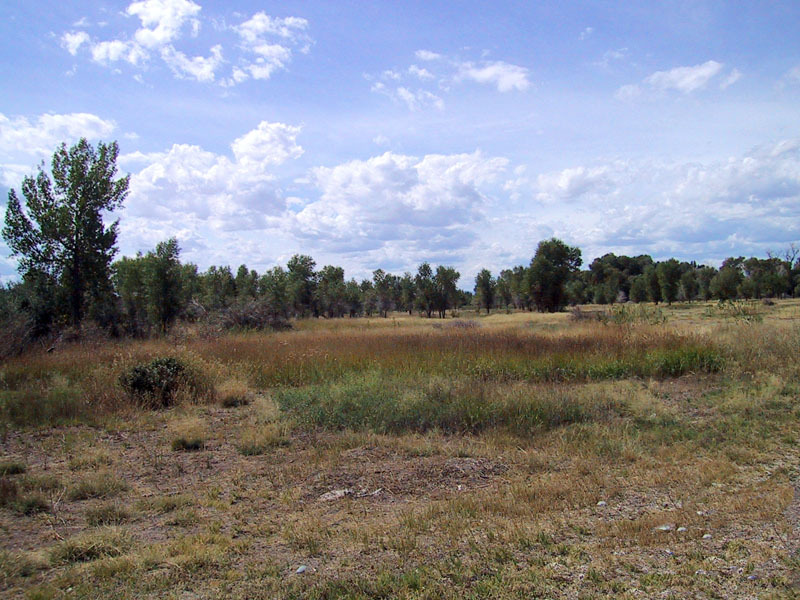 In June of 1825, Provost and his men encountered William Ashley in the Uintah Basin. 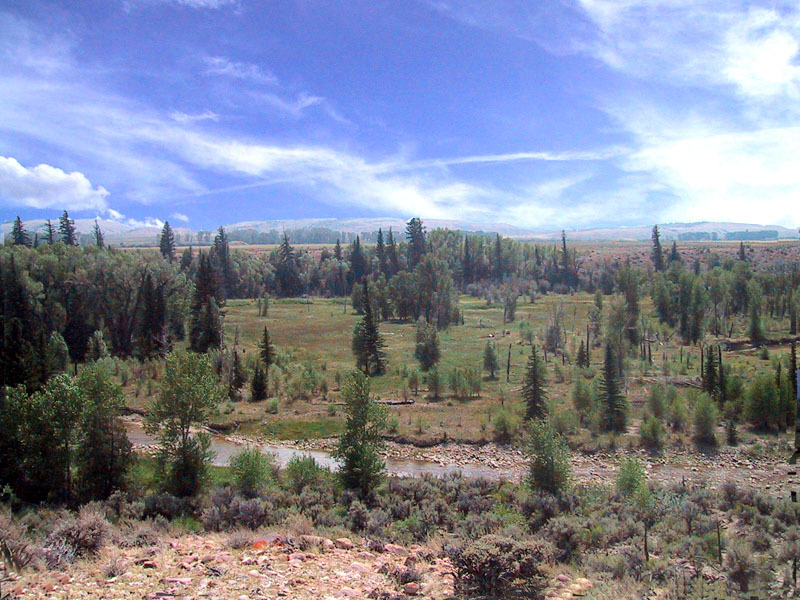 Provost agreed to guide Ashley to Henry’s Fork of the Green River where Ashley had arranged to meet his trapping brigades. The first rendezvous of the Ashley mountain men lasted one day, July 1, 1825. Ashley left the next day for the Missouri River with 8,892 beaver pelts…100 packs. Following the first Mountain Man rendezvous held in the Rocky Mountains, Provost and his men returned to Utah Lake. Provost built/or had built two fur trading posts there. One was on the Timpanogos River (present-day Provo) near where it emptied into Utah Lake (Fort Ashley?). 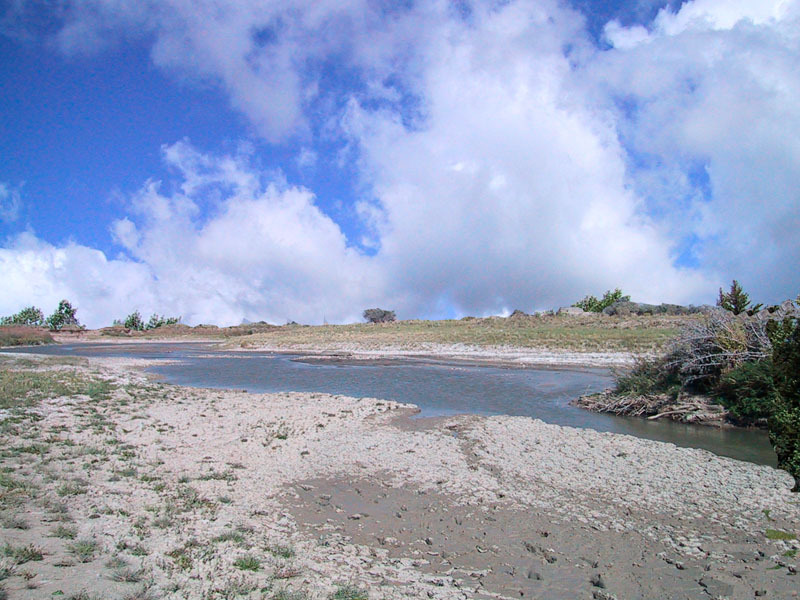 The other was on the Proveau River (present-day Jordan River). These were temporary structures, probably no more than a brush hut with a makeshift barricade around it….Ashley is often credited with building a Fort Ashley in Utah Valley, but there is no evidence of Ashley being in Utah Valley. Why would he? Ashley rendezvous system was built on not using fixed trading posts to supply his trappers. …We put ourselves in an attitude of defenc[s]e, as soon as possible by throwing up a fort of logs and brush. …We immediately tied our horses to bushes near and put up our saddles as a kind of breastwork but before they reached us, they turned off into some timber on a stream, built a kind of fort of logs, bushes, their saddles and blankets, as a shade if we attacked them, and took their horses into the fort with them. As the above examples point out a hastily constructed pile of brush and logs often constituted a mountain man fort. If logs and brush were not available, saddles, packsaddles, panniers, bundled packs, and anything else they could get behind made do. I cannot hazard an opinion of the project with yet it seems to me we would be advised to assure ourselves of Provot, who is the soul of the hunters of the mountains-he will do us harm, and if only to his reunion with the Robidoux, it seems necessary to me to make sure of him. The agreement with Provost allowed him to continue his own trapping ventures while carrying out assignments for B. Pratte and Company. The winter of 1828-29 Provost stayed in the mountains with the Crow Indians. He fathered a son, Nicolas, with a Crow woman. Allegedly Nicolas and his son, Michael, served in the Civil War, and later Michael was a Crow scout with Captain Benteen at the Battle of the Little Bighorn, however, military records do not support this allegation. Provost discontinued his own trapping after 1830, and started leading the American Fur Company supply brigades to the annual fur trade rendezvous in the Rocky Mountains. In 1834, the B. Pratte and Company bought the Western Division of the American Fur Company from Astor. Lucien Fontenelle and Etienne Provost led the supply train to the Ham’s Fork Rendezvous. At the rendezvous on Ham’s Fork, the Rocky Mountain Fur Company was dissolved…B. Pratte and Company were now the major rendezvous suppliers. 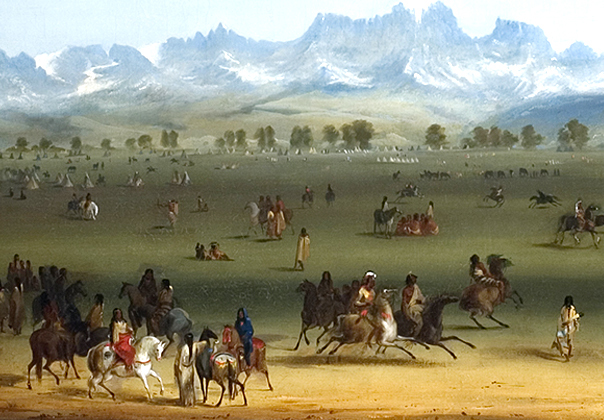 Accompanying Thomas Fitzpatrick and Etienne Provost to the 1837 Green River Rendezvous was William Drummond Stewart and the painter Alfred Jacob Miller. Miller sketched and later painted several pictures from the 1837 rendezvous. It is interesting to note that Miller did not paint a picture of Fort Bonneville with Indians and trappers trading out of a blacksmith shop as described by archaeologists. Monsieur Proveau, subleader, with a corpus round as a porpoise. Old Provost the burly Bacchus” as “a large heavy man, with a ruddy face, bearing more the appearance of a mate of a French merchantman than the scourer of the dusty plains. Pratte and Company was reorganized in 1838 as Pierre Chouteau, Jr. and Company. Provost led the supply train to the 1838 rendezvous at the junction of the Popo Agie River and Wind River near Riverton, Wyoming. After sixteen years as a fur trade brigade leader, the 1838 rendezvous ended Etienne Provost involvement with the the Rocky Mountain fur trade…he never returned to the Rocky Mountains. Etienne Provost is one of a hand full of men who was an active participant in the Rocky Mountain fur trade from its inception to its demise. Nicollet’s mapping expedition in 1839. British officers on a buffalo hunt in 1840. Audubon’s natural history expedition in 1843. Comte D’Otrante party in 1844. While Provost was with the St. Louis fur company, he had an interest in a tavern and grocery (saloon) business in St. Louis. Provost may have been in partnership with his future wife’s father, Lambert Salle dit Lajoie, who had operated a tavern and grocery business in St. Louis since 1811. Provost married Marie Rose Salle dit Lajoie in 1829. Etienne Provost died on July 3, 1850 in St. Louis. He is buried in the St. Louis Cathedral cemetery. Provost was survived by his wife and a daughter. Etienne Provost is considered by many historians to be the first man of European descent to see the Great Salt Lake. Provost’s reached the Rocky Mountains before the Ashley-Henry trappers arrived. Regarded as the “Man of the Mountains” by his contemporaries. Provo River, Provo Canyon, and the city of Provo, Utah are named after him. That Provost was one of Ashley men. That Provost discovered South Pass. The Etienne Provost article was written by Ned Eddins of Afton, Wyoming. This site is maintained through the sale of my two historical novels. There are no banner adds, no pop up adds, or other advertising, except my books — To keep the site this way, your support is appreciated in purchasing my books. 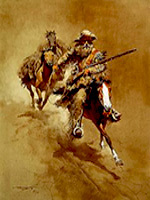 To return to the Mountain Man home page click on the Fur Trapper logo. Hafen, LeRoy R. Editor. Trappers of the Far West. Bison Books. University of Nebraska Press. Lincoln, Nebraska. 1983.